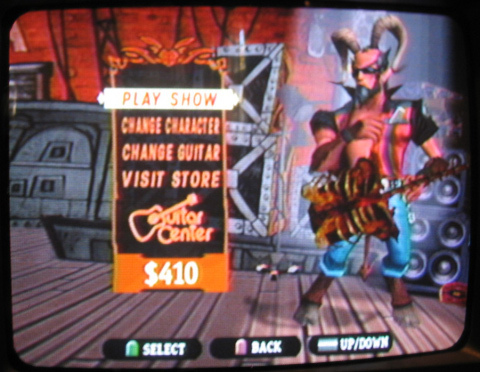 The final boss of Guitar Hero 3 was Lou, pictured above. We thought the inclusion of the devil himself was just for fun, but it appears Activision's involvement with the forces of Hell go a little bit deeper. What's that? You need proof of this unholy alliance? Look no further than this quote from Activision CEO Bobby Kotick. "The ability to offer these songs on a subscription basis may very well result in the newest subscription opportunity in our portfolio." You're probably thinking, no big deal, they've been talking about a subscription based model for Guitar Hero DLC for some time now. However, the songs he's talking about are not new tunes from established bands. He's referring to user created, downloadable content available from GHTunes in Guitar Hero World Tour! Yes, that's right; the suits running the Guitar Hero franchise now are thinking about charging other people for YOUR user created content. This whole notion is preposterous on so many levels. You can expect to hear more about this kind of thing from Co-Optimus in the future, I assure you. What say you, readers? Do you think Activision making money off of user content is a great opportunity, like Bobby Kotick?